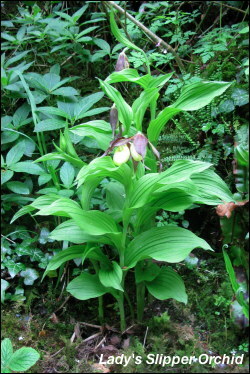 As a variation from birds we took the opportunity to photograph one of only two Lady’s Slipper Orchids in Britain. The flower heads were just beginning to open and it was a rare treat to see this gem in the Cumbrian countryside. All week it has rained with a strong wind blowing over the hills and once again it was impossible to consider filming the Golden Plover – today the young fledged. We shall now have to wait until next year! 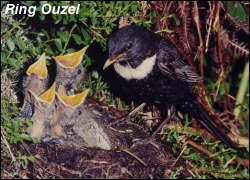 The highlight of the week was obtaining film of the Ring Ouzels. The female is on eggs but every hour or so the male calls her off the nest to feed her. He then visits the nest, inspects the contents and leaves when she arrives back to continue incubation. Its a long wait for a few seconds of film but it’s the only one I have. The good news of the week is that the Long Eared Owls that deserted their eggs because of the campers at Easter have relaid in the same nest. With another Bank Holiday coming up and good weather forecast surely there will not be a repeat performance? 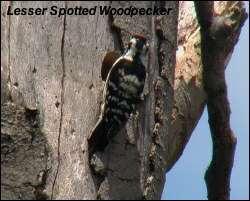 I only took one still shot through the video camera and here it is the male Lesser Spotted Woodpecker about to enter the nest hole to feed newly hatched young. I had a magical three and a half hours filming on a sunny afternoon and the big bonus was that on two occasions the male alighted at the bottom of the tree and searched for food all the way up to the nest hole at thirty five feet! It has been very windy all week and the Golden Plover and Curlew on the high moorland will probably have hatched their eggs before I get the chance to film them. A visit to Bowland produced a pair of Merlin on site but as yet not incubating. In the woods nearby three pairs of Pied Flycatchers were located on eggs and Redstarts were singing everywhere. It was good to locate a pair of Ring Ouzels which are now in short supply. In the sunshine early in the week Orange Tip butterflies were active along with Speckled Wood but the heavy downpours of the last few days have put an end to their flights. Unfortunately another poor weeks weather has been forecast so this May is following those of the last two years. One of the bonuses of being out there in the wild is that even when the birds don’t perform the weather can. This photo of a Pennine sunset was the only highlight of a night waiting to film hunting male Long Eared Owls. The birds failed to perform but after an evening shower the pink in the sky was magical. It has been a wild week with only one day good enough to venture above one thousand feet. So the search for Merlin, Ring Ouzels and Golden Plover has been put on hold. The big bonus of the week was filming Lesser Spotted Woodpeckers that were incubating eggs in a tiny hole thirty five feet off the ground. The bad news was that is was over in Yorkshire and they only changed over on the eggs every hour and if you blinked you missed it! The farming weather forecast for the week is not too good so the calm weather that is needed to go up onto the high moors is going to be hard to find. On the migration front it was good to see Swifts today and the first Whitethroats singing. 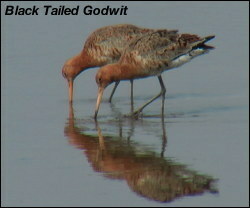 This weeks photo shows two of the fifty three Black Tailed Godwits that passed through Islay last week. It was taken as a still photo through the video camera and is only one million megapixels but the results never cease to amaze me. The wader passage on Islay continued into our second week with a flock of thirty Whimbrel feeding in a seashore field making an impressive sight. A male Ruff was also present on the RSPB reserve. Our second week on Islay also produced more sightings of Short Eared Owls with six different birds being seen on one night. A Merlin and Golden Eagle just added to the spectacle. Otters began to appear with two sightings, the best being in Port Charlotte bay on our last day. It was a dog Otter that finally brought a fish onto a rock to eat before being washed back into the sea by the waves. Woodcock continued to elude us, the bird we flushed during the first week being the only one we were to see despite hours of searching in what was perfect nesting habitat.